Judith groaned. She was as stationary as George’s daily attempt to reverse and, she looked sad, really sad. Her normal positive go-get-em attitude had faded. 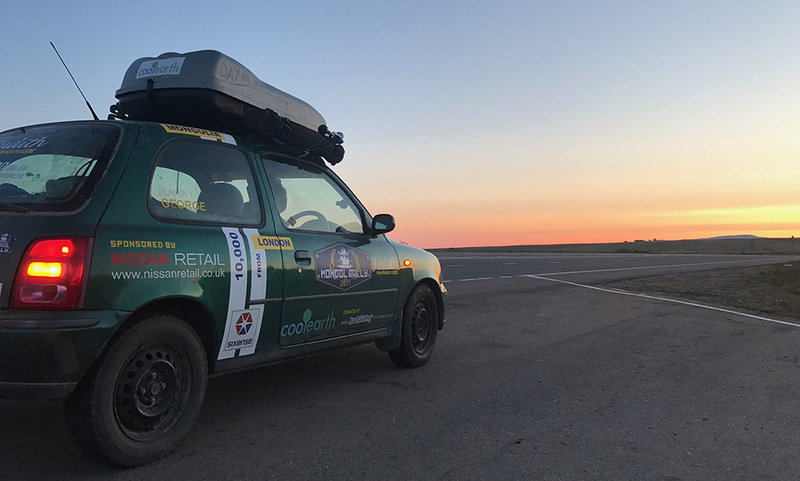 This was the last push to the finish line of the Mongol Rally and yet, we were motionless. Lush green fields surrounded us, kept trim by herds of goats and cows that gracefully traversed the land. Horses galloped in the distance as a rainbow illuminated the land behind. A gentle river swept through the valley and out across the plains. And, in the middle of this idyllic picture was Judith, sunk two feet under water. We were stuck. Within seconds water started trickling through the doors. A gentle seep turned into pretty bad rising damp and, before we knew it, the pedals were drowning. From door sill to door sill it was river. I looked out through the passenger window towards George who stood in disbelief, and out to my right at the bridge, we’d just crossed – the marvellous man-made invention that prevented sticky situations such as these. No pulling, tugging, revving or reversing would shift her. 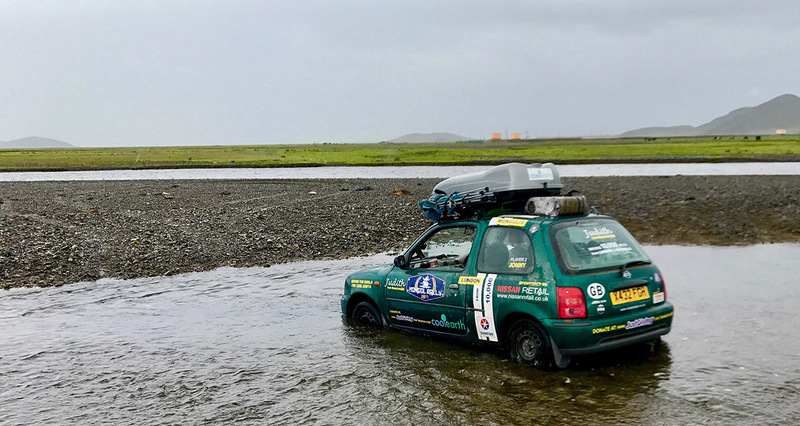 Eight-inches of fist-sized pebbles swamped her dainty road-tyres, and even with a tow from team Zazgar’s 1.3 litres, we weren’t going anywhere. There’s nothing like a river crossing to really prove you’ve done the Mongol Rally…I had thought, double backing on the bridge. As locals in an SUV dragged Judith out from her backside, I began to reflect on my decision. The mess tins we’d brought with us to eat from proved brilliant at bailing the water out. A quick scooping action emptied the 12-inch-deep water in the foot-wells in probably, around 15 minutes. Leaving the engine running to air her out, it seemed we had had a lucky escape. George reminded me every few minutes how stupid I was, but I smiled inside, relieved at our lucky escape – but giggling like a child at the situation we’d (I’d) just got ourselves into, and out of – just. On the move again, drenched from foot to waist in river, we whacked up the heaters to try and get warm again. That’s when the smell began. Luckily, the only repercussion. 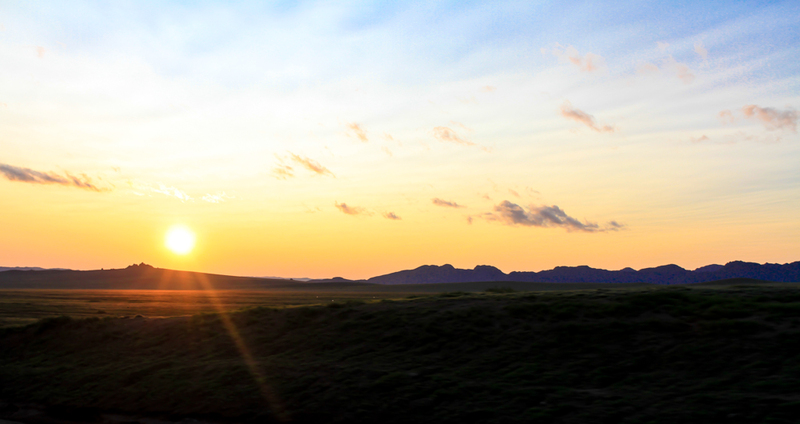 Ulaanbaatar was our last stop in Mongolia. 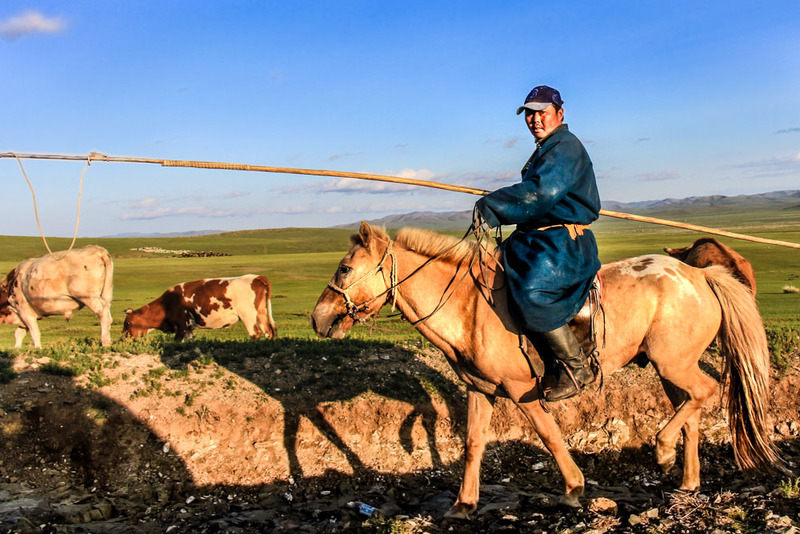 The capital is home to two million of Mongolia’s three million population. The average person earns just $350 per month, and yet land cruisers raced down the highways and the city felt far from undeveloped. It was a strange mix of Asia and the west, and something was familiar. Out to the east of the city, around an hours drive, we visited the Genghis Khan statue. 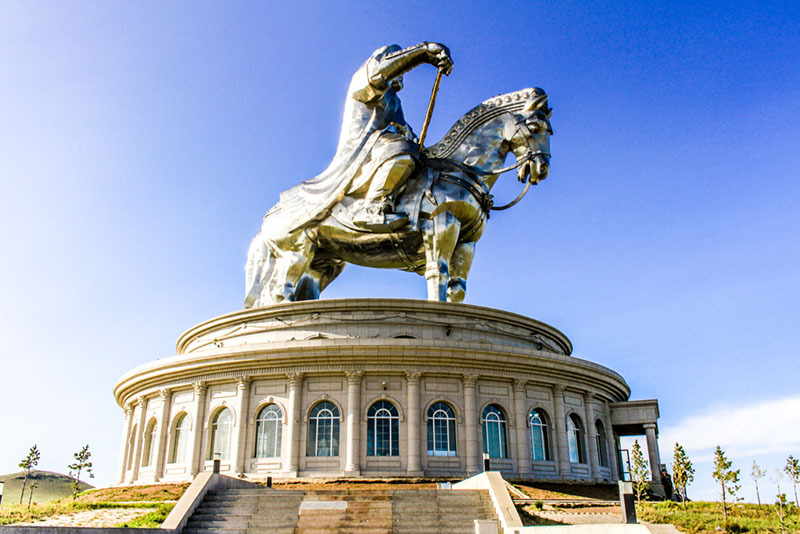 Genghis on his sturdy horse stood proudly in reflective sheet metal, atop a circular museum dedicated to Mongolia and its heritage. As we stared, frankly quite baffled, at the large single boot reaching from floor to ceiling in the entrance, a lady walked up to us and started talking. I thought we’d accidentally paid for a guide but it seemed part of the service. She went on to explain that in fact Genghis and his horse are part of a bigger plan. Some 40 Yurts are set to be erected along with an Alton Towers style fun area just a little further down the valley. 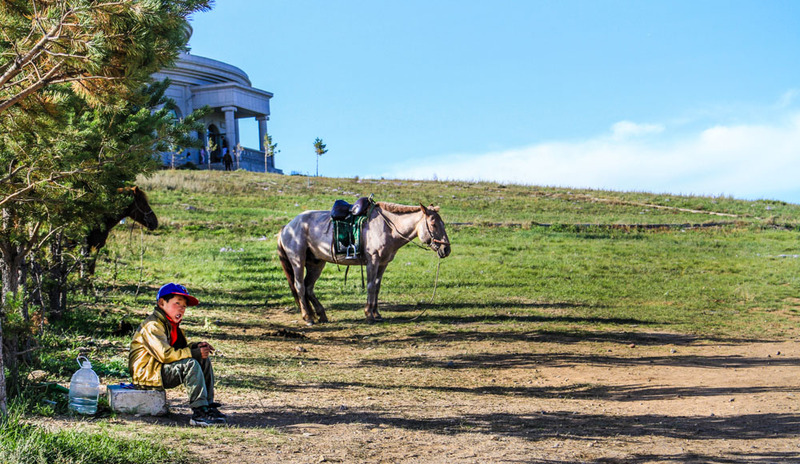 For me, it tainted the point a touch, but for locals we spoke to earlier that day Genghis and his horse immortalised in steel seem to symbolise a new direction for Mongolia and Mongolians, with their new government, more stable currency and a support from Russia. As Team Zazgar were enjoying the AC of the nice Swiss man’s SUV (don’t know about this? – Read the last blog) we’d been trailing behind with biker Rakesh, making sure he didn’t get into trouble. An hour out from Bayankhongor and we got our fourth flat of the trip. Our last spare, 13 inches not the 14 required, got us to Ulaanbaatar where we were now, but we needed a fix quick to get us down the home straight. Nissan Mongolia offered to fix our puncture and, after leaving the car for the day for some TLC, we came back to find Judith with a new look. Four winter bashing, Pamir powering, Mongolia mushing monster tyres now accessorised her slender lines and curves. Once a woman, she was now a beast. Her new outfit made her look fit for purpose; disappointing, we thought, having covered 9,000 miles with less than three inches of ground clearance and only now getting suitable tyres. But, grateful of course we jumped in and set off. Ulaanbaatar was built for 600,000 people but, as of 2017, the city booms with over two million residents. Car registration plates end with a number from 1-7. If it’s a one, it means in Ulaanbaatar you can’t drive on a Monday. It’s designed to limit the traffic. The next few miles we chugged at a snail’s pace competing with what seemed like 1.6 million commuters trying to get home. But, once the traffic spread out, we realised we had a problem. Picking up speed every small bump would cause Judith to bob – her rear wheels rubbing against their arches and bumper. A piercing scrape echoed through the car every few metres and 30 miles an hour was the limit. We got out to inspect and realised she was just sitting too low for the size of the tyres. We unloaded our excess fuel, camera women Alex, our extra bags, and George whipped out his penknife to saw off what seemed to be the offending piece of bumper. 10 miles down the road and it was better, but not fixed. A second look revealed that the entirety of the wheel arch was now a polished silver. A small lip of metal at the very top seemed sharpened, and without a doubt was damaging the tyre. We would not make the remaining 800 miles safely or in any sort of time if we were to carry on. A family, head by chief mechanic mum, gazed across the way at our bemusement. Squatting to work in a shopfront refashioned from an old shipping container, they were repairing bicycle wheels and selling pre-loved tyres – none of which would have fitted. Conversation through sign language and signally began. They could see our problem but were as baffled as us as to what to do. Ten minutes later though, and a friend they’d called upon hopped off his rusting bike with two suspension springs. They were slightly odd sizes, both equally as thick but one a few rings longer than the other. A few more trips back and forward to this mystery spring graveyard, plus help from their neighbour to cut one down, and we had two perfect ramped up springs. Between us and two jacks we dropped out the old springs that had served Judith so well up to this point. They were in perfect condition, but replacing them was the only way to get the tyres away from the wheel arches. 12 minutes each side it took – me getting my hands greasy and George watching. His words as we set off to test them out, ‘I didn’t realise it was so easy’. We aimed at a few gentle potholes to see how she’d hold up – it was like riding on air. We were now four inches higher with plenty of clearance around the tyres. Just the rear end we’d swapped so there was a slight slope to Judith now, but other than that, we’d done a sterling job. New tyres and our raised suspension had eaten up a day. Up until this point we were bang on schedule – a schedule designed to get us into Ulan Ude in Russia with enough time to organise our car shipping, have a night out, and get our flight booked for September 2nd. There was little choice but to drive on through, and aim to get to the finish in the early hours. Border crossings were always unpredictable. The Mongolia / Russia border was slow to warm up, with a 45-minute wait at the exit of the first checkpoint. It was midnight, and the Siberian freeze was taking its toll. Luckily, a nice Russian lady, similar to the women who strangled James bond in Tomorrow Never Dies, was very helpful in sorting out our paperwork, and we were off. The border was the halfway point from Ulaanbaatar to the finish line. Me and George took it in turns to nap, and eventually, after eight hours, four tins of red bull and three Snickers we’d arrived. Perhaps you were expecting a dramatic climax? Well, so were we. This wasn’t quite how we’d anticipated it. We’d a vision of rolling up the finish podium with cheering crowds and blaring music. Instead, it was 7am and everyone was asleep, including it felt like us. But, we’d made it. We powered on through the day cleaning and sorting out our car, before bypassing beer and hitting the hay at 8pm. We woke up to the strangest feeling. It was the first-day bar one in seven weeks that we wouldn’t need to drive. There’d be no navigating (no more arguments), and no worrying about where’d we sleep. There was no schedule, no milestone to get to, no driver swaps every 100 miles, no town names we couldn’t pronounce and no more weird horse balls. We’d honked our last honk on our cable-tied roof bar horn. George had completed his 200 stall target. No one was going to pass us biscuits through the window as we drove at 100km an hour. We could have a shower, rather than washing in a lake. There’d be no Turkish men to keep us awake as we camped in the middle of nowhere. And, there’d be no more shitting in the woods. We were back to civilisation, 24 hours away from London. And, that feeling, the one we’d been racing towards for seven long, incredible weeks, sucked. Well, for you, head over to https://www.jonnyhale.co.uk/Mongol-Rally-2017 to view our full gallery of pictures. If you enjoyed our stories and pictures and haven’t yet donated, please do so here. Afterall, our rally whilst amazing fun, was all in aid of Cool Earth. Click here to donate. 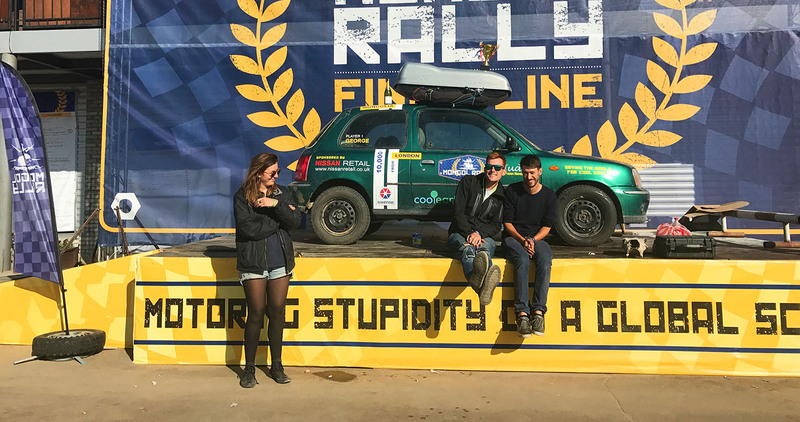 If you’re not up to speed on all our adventures on the Mongol Rally you can take a look at the rest here. How does Cape Town to Cairo sound….pretty incredible right! Well, that’s my next big adventure. Afterall, it’s got to be somewthing pretty special to beat this one. If you’re reading this on a whim – please be more committed! Click here to subscribe.